Hello dear readers and welcome to our new page tag which is designed to cover all non-40k related gaming. For our intro series, I'll be taking a look at one of the newest games to be making a splash in the miniatures gaming community: X-Wing! According to a recent poll over on BoLS, this game came in second among the top 5 minis games, right behind 40k (top spot) and ahead of WM/H. For a game that's not even turned 2 yet, that's pretty impressive. Add to that the fact that Havoc is the biggest Star Wars junkie I know and a few locals had already gotten into it and recommended it, and I figured I'd cash in some of my points at GPB and grab the starter as the no risk investment in the start up was a no brainer. Hit the break for my full review! Naturally, the first place this review was going to start was with examining the starter box I picked up. IT's got a MSRP of $40, but poking around on eBay shows that it's not too challenging to pick them up for $25-30. Cheap, but how effective or practical is it on the whole? Well, immediately I'll ask you to consider that a basic ship runs about $15 (cost of a 40k blister when I started the game) and comes with a pre-painted and assembled ship and all the components to play it, including cards. So, you save $5 for the pair of TIE fighters and lone X-Wing that come in the box. It's not uncommon though for a company to eat a loss on a starter to get us hooked, so let's look at what else comes in the box. Oh yeah, this is one of those games where unless you buy some of the components 3rd party, you'll have to buy the starter. 6 custom dice and a ton of punch out custom movement templates, including a custom "measuring stick" for range. Ugh, really annoying. First part that's annoying is 3 of each dice, mostly because right out of the box, it's quite possible to make attacks or roll defense dice to the tune of 4 dice. Sure, you can buy extra dice at $8 for another set of 6 (3 of each again), or download a $5 app to use for the dice (probably the smartest out if you play any of FFG's SW RPGs as it includes those custom dice as well) but it really means that you and a buddy can't just crack two and swap factions and reasonably expect to play without throwing dice up and down the table. Poor design FFG. Then comes the custom units of measure the game uses. If we assume a game has a finite degree of complexity, X-Wing has shrugged off CC (for obvious reasons), and rerouted that complexity back into the movement phase. Logical for a dogfighting game, but nevertheless obnoxious, and certainly contributes to the mega hard learning curve of the game. Your available maneuvers are dictated by your ship, which comes packaged with a maneuver dial. Great for making bombers feel slower and less agile, and subsequently showing that agile ships have no brakes in space. In this way, there are "straight", "bank", "sharp", and "Koiogran (rolling backflip)" maneuvers. It's at this point that I'll circle around to my initial comment about the models. Before we dig into the gameplay any further, I really want to address this, in no small part because I touched on it remarking about the price of the starter, but haven't come back around to it, and it makes more sense to include it with the box contents summary than anywhere else. And the ships are stellar. If you've played with micro machines like me when you were a kid (or bought the micro Star Wars Legos), you appreciate these. The details are crisp, and the paint is respectable. Sure, there's no building (which does slightly disappoint me) but the models look good enough that I find it hard to get too upset, especially for their costs. For those of you who haven't played a Fantasy Flight Games system, they have an unholy fetish with lots of decks of little cards, and a similar such thing with custom dice. Thankfully this really isn't too bad in X-Wing, where the only random deck of cards you deal from is damage, which really only becomes random as ships take critical damage. Sure, those and the non-pilot cards are in a smaller size, but it does serve a purpose in that you put the little cards around the big ones to compose your force. 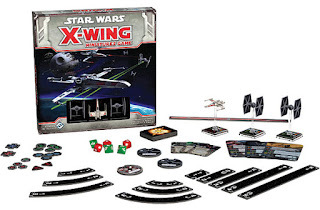 Like many other games, X-Wing is played in phases, with a hybrid player action organization. This means that the game doesn't progress to the next phase until each player has finished all of their actions in the current phase. This starts with the planning phase, where each player decides on all their maneuvers and hides them on the respective maneuver dial. Then play proceeds into the movement phase, where each ship moves and takes other non-shooting actions, starting with the lowest pilot skill and then progressing upwards. Certain maneuvers stress your pilot and bar them from actions, and different actions can bolster attack or defense, as well as offer positional options. This is by far the most complex and hard to master part of the game, and failing to respect its intricacies will lose you games. And finally, you end the turn by shooting. It's super easy to tally up who's rolling what (including modifiers from that custom range indicator), and know it all well and truly ahead of time, so these go quickly. The issue here is that everything seems to have the same bullets and dodge by flying in the same direction, as the red dice and green dice have fixed ratios. Sure, there's rerolls, but no ways (beyond expending focus actions) to alter those percentages. So, if you want to show that a ship is better at something, the only way to do so is to have it roll more dice, and the only way to differentiate between pilots of the same ship is with differing pilot skill, or abilities, since very very few pilots actually modify the base characteristics of the ship they pilot. This funnels into a larger problem, but we'll hit those in the next section. The first observation and experience is the shift in business strategy. A release drops every 6 months or so. Each faction (Rebels and Empire) get something. And that's likely the way things will continue indefinitely until or unless they decided to do Clone War Era gameplay. With there only being two factions, each can try to imitate the other's core design principle, but ultimately, it's "Elite Synergists" for the Rebels and "TIE rush kikiki" for the Empire. Which underscores what I hinted at earlier. FFG, not unlike GW, has failed to accurately define the lone abstract "point". The factions are mostly balanced, but the TIE rush is brutal in terms of presenting an army with low learning curve which will crush the other guy assuming you're both newer players. That said, the game still approximately clocks in at about $100-200 to play all the ships of a single faction (especially with ~30% off on eBay! ), which is super appealing, especially when mated to the game's 50 minute approximate length. Though by no means as deep as 40k, I can't not give the game a passing grade. The nostalgia and pew pew factors, mated with the relentless pacing and satisfying models have me grinning ear to ear, because even if I lose, I know I've still got room to grow, and don't truly have to cope with my opponent being able to deny me interesting choices and ignore the consequences of his poor decisions. That said, those low spots will certainly grate on some as badly or worse than they do on me, and I'd absolutely respect not playing a game for gnawing issues in the base system, no matter how insignificant (I'm looking at you MtG 15 card frames!). I'll also note here that my FLGS just held our first X-Wing day. 6 participants and we tested both of the "huge class" ships for the rebels. They're a touch underwhelming at present, but hopefully FFG will get their "apocalypse/super heavy" rules in order and touch them up. Otherwise, the event serves to reinforce my initial impressions. The game is very fun, very social, and more than a little beer and pretzels at its core (at least if you're playing with us fluff bunnies). Options abound, and that quick pace keeps everyone interested, even in larger games. Not only that, but it feels much harder to min/max (or exploit) than 40k, as the rules are on the whole simpler, including those pilots which offer exceptions to the rules. Do you like Star Wars, aerial combat, and/or want to rack out a game in ~50 minutes? Did you say yes to at least two of those questions? Find a buddy, buy two starter boxes, and give it a shot. For less than the cost of a current gen video game, there's a lot to learn and have fun with out of the box, and if you're not enjoying yourself, you can likely sell back out of the game for half what you've got in it, or more. I don't know about you, but any game that will cost me $10 to try for an hour or two is worth it to me. There's X-Wing. Look forward to some more content on this game from me moving forward, and stay tuned to Rites as we continue to go out of our element and explore other systems!